Our Handy Handwash is available in three versions, either a 3.1kW or a 7.1kW manually operated handwash unit, or a 3.1kW 'no-touch' automatically sensor-operated unit. 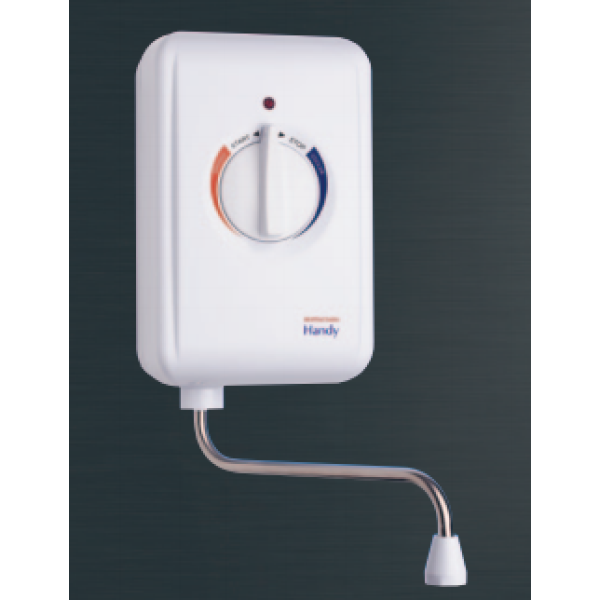 Handy requires only a cold water supply and a mains electrical connection, to provide a convenient output of warm water for hand washing. Designed to be installed over a basin or sink to provide an instantaneous handwash, these compact units are ideal for workplace washrooms.For safety protection the Handy features a pre-set safety cut-out to prevent overheating and an integral pressure relief device. With a push-fit plumbing connection and concealed electrical supply, the Handy Handwash ensures a quick, tidy and hassle-free installation, with the slimline design of the unit only requiring a small amount of wall space.